August 9 is “officially” National Book Lovers Day! We say “officially” because—let’s get real—every day is National Book Lovers Day for avid readers. But just as Valentine’s Day serves as a special day once a year to go all in for the person you love most (even if that person is you! ), why not take this occasion to celebrate your devotion to books and treat yourself? In honor of this special day, Bas Bleu’s editors put together a collection of ten items we think particularly capture that bookish love we all know so well. 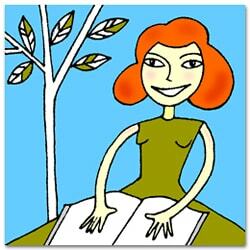 Intelligent, thoughtful, empathetic, well-informed…well-read women are a force to be reckoned with! Whether you’re sipping coffee, tea, or the tears of the patriarchy, they’ll all taste that much sweeter when drunk from this inspiring mug. Trailblazing women, boldly proclaim your bibliophilic powers while you’re fueling up for the day! Yep, book towns (defined as “small towns, usually rural and scenic, full of bookshops and book-related industries…[designed to] encourage sustainable tourism and help regenerate communities”) are a real thing! Add a day trip to a book town on your next vacation with the help of this handy guide…or plan a retirement fit for a true-bleu book lover! As bibliophilic mantras go, it’s a good one. Whenever life begins to feel overwhelming, a reading break goes a long way toward righting the ship…or at least keeping reality at bay for a few hours! We’re singling out this sweet, breezy novel for National Book Lovers Day because it centers around the lives and loves of the proprietors and customers of a small-town bookstore in England. Love stories, heartbreak, and friendships abound, a wonderful reminder of how books can bring people together. You’d be hard-pressed to find a book lover who isn’t also a library lover, since so many bibliophiles rely on their local libraries to feed their addiction. Proudly proclaim your not-so-scandalous love for your library with these clever crew socks. Think books can’t change the world? Think again! This gorgeous tome guides book lovers on an illustrated tour through literary history, heralding one hundred significant works renowned as political, scientific, economic, and cultural milestones. How many have you read? If you’re a book lover who’s also a sucker for miscellany, you’ll swoon for this collection of esoteric, lit-minded lists. Best of all: Next time you’re searching for an interesting conversation starter that doesn’t involve money, politics, or religion, try throwing out a few of these fascinating random facts! What’s inside? We’re not telling! All we can reveal is that the package comes loaded with a mix of fiction and nonfiction, all Bas Bleu titles you may have previously passed over. It’s a gamble, to be sure, but a low-risk one for voracious (and deal-loving) book lovers! This may be the ultimate book lover’s treat: For a flat annual fee (which is considerably lower than that of some of the, ahem, other guys), Bas Bleu Society members enjoy a bouquet of benefits, including free shipping on all standard-delivery orders, 15% off most books, discounted gift wrapping, and special e-mail offers. Plus, the membership comes with a 100% satisfaction guarantee. I’m glad you added something about Libraries. I keep telling them that if they stopped ordering books that I HAVE to read, I might get some of the books on my own shelf read (and then I could buy more books too). Sigh…. Hmm…I suspect your librarian is not remorseful at all!